I keep my email in folders and to do this (since subjects and senders are all different), I use the Move Icon. Click on an email and select Move. A list of folders opens and you move the email where it belongs. Now every once in a while, it would be handy to have the same email in two very different folders because it applies to both subjects. So then I use the Move pull down, and select “Copy to folder” and do that. Then I go back to the same email and select “Move to folder” and move it to the other folder. Now I have save my email in two places. A lot of my emails have varied subjects and varied senders, so Rules do not help me much. In addition, rules can go bad and Outlook can go haywire. Accordingly, I do not use Rules and I know better how to manage my own email in my own way. Rules are OK (barely) but I do not really recommend them. Like everyone else, I get emails for which I am one of a number of recipients. If I must reply, I take care whether I “Reply” or “Reply All”. We all get copious quantities of email. Indiscriminate “Reply All’s” are usually not appreciated. Take care with your replies and your users will thank you. A subset of Reply is “Forward”. Reply does not keep attachments; “Forward” does keep attachments. It is handy to differentiate how each one works. Deleting emails can also cause issues. When you delete an email, it goes into the “Deleted Items” folder. I set Outlook not to empty “Deleted Items” on exit. That way, there is a second chance to recover a deleted email. I am very careful about this but accidents do happen and I like a second chance. From the reading pane (where you can see the email) or else open the email and then right click on the attachment. You can remove the attachment (which deletes it) or select “Save as” and save the attachment to a permanent folder. I find it helpful to keep important items in Windows folders for later access. I use the Reading Pane a lot. Most people (not everyone) say what they need to say in the first paragraph, so the Reading Pane makes it easy to manage work. No need to actually open the email in most cases. In the Reading Pane options, I set the email to be marked “Read” after 2 seconds. I only want “Unread” emails briefly. I read the emails and then put them in folders right away except for a very small number I keep until Saturday in my inbox. The settings for “Folder Pane”, “Reading Pane”, “To Do Bar” and “People Pane” are under the View tab. More about these later. The setting for Message Preview affects how many lines one email header uses in the email list. This setting is also in the View tab, but it affects how much space is used for the list of email headers. The default is 2 lines and I turn it off. That way I have more lines available for email headers and that suits me better. You should always use what suits you better, but Microsoft defaults are usually not set for effective productivity. I use Mail.com to filter out spam. Very rarely, I do a Send / Receive and my email appears to have vanished. Outlook (properly installed and set up) does not randomly delete emails. So I look in my Junk Folder and usually that is what has happened. This is indeed rare, but you can pull down the Junk icon and see Settings at the bottom. I turn Junk filtering off, but you may wish to use it and this is where you find the Junk Mail settings for safe senders and recipients. There is a Search Bar above the email list of headers. Look closely at that bar. When you click there (say to type something), it bring up the Search Toolbar. In here, you can search through “All Mailboxes” which includes Archives, “Current Mailbox” or specific folders. Under Search Tools, you will find Advanced Options. For the most part, I type something and see what it finds. I have “All Mailboxes” enabled. If a basic search through all mailboxes satisfies my current need, fine. Otherwise, I go back and use the Advanced Options. Sometimes it takes a couple of tries to find exactly what I want because lots of client emails are similar in content. I do not use categories because it does not fit my need (Many clients and subjects and all my clients are important). You might find Categories useful in your work. Up to now, we have found everything we needed under the Home screen tab. Let’s click now on the View tab. Here is the main View Screen. View Settings brings up a Window of what columns, groupings and sorts you use. You can change the labels of columns, date formats and many things in here. When you have a folder the way you like, click on the Change View pull down and you can “Apply the current view to other folders”. This way, you can make all folders look and sort the same way. This is very handy in my work and saves time for me. Message Preview gives you a preview of the email message that also sits in my reading pane. It wastes space and hurts my head. I turn it off as one of the very first things I do with Outlook. You may see things differently than me. Folder Pane shows the folders down the left side of the main Outlook Screen. I set this to Normal and do not use favourites. Many clients and subjects do not lend themselves to favourites. Using favourite also makes the folder list short and I would have to scroll more often. Reading Pane is on the bottom below my list of email headers. You can set Options in here, and I have the option selected to mark Email as “Read” after 2 seconds. To-Do Bar is set to show my Calendar. I keep tasks in the Subject field of my Calendar so the appointment reminder tells me who, what, where and when all in a glance. The calendar is a critical organizational tool. I keep my whole life in my Calendar and I sync it to my iPhone. Reminders keep me on track. I keep records of appointment details in the appointment, mileage, parking, transit and other details. This is my record for my billing spreadsheet which I then use for invoicing in QuickBooks. I allow my Calendar to be archived and so I retain the details of work engagements back to the beginning of consulting. I create appointments about 6 months in advance. In my life, appointments are not recurring so I cannot usually use the recurring appointment feature. I have one client (of a number) where I usually show up Monday and Thursday. Many of our holidays fall on Mondays as well. I set up a base appointment where Subject is the client or volunteer name, Location is the address, the date is (say) today when I set up the first appointment, and time is the average time I spend on that client on a daily basis. I save this first appointment (of a series of appointments to come). Now I have a new trick for you. I am willing to bet most readers have never seen this idea before. Save the appointment, click just once inside the appointment (do not open it) and press Ctrl-C. Now move the next day. So I made this appointment for Monday (say) and I move to Thursday, click once on the time slot and press Ctrl-V. A copy of the appointment goes into Thursday. Move to the next day (it might be Tuesday if Monday is a holiday), pick the beginning time and press Ctrl-V again. Another copy is created. Move to the next day, Ctrl-V and so on and inside of about 15 minutes I have 6 months of appointments all on the correct days. Then I go back to each appointment and fill in the tasks in the subject line, e.g. client (Payroll). This takes a few minutes, but now I have a game plan for that client for 6 months. As I execute appointments (show up at client office) I fill out expenses, billed hours and activities in the appointment note field. This becomes a journal of activity and shows up in my iPhone as well. This is good business planning and keeps me on track. Your Calendar is exceedingly important. People Pane is another invention that uses space on the screen with little value to me and so I turn it off. Contacts are the people and groups you mail to and get mail from. I make sure I have name, address, phone number and email address in every contact. I set up groups in here and populate them from my contacts. Make new contacts and groups with the “New Contact” and “New Contact Group” icons. The key thing for contacts is to use them, and to populate each contact with name, address and phone numbers. These synchronize to your iPhone with iTunes and then you can easily access contacts and their phone numbers in your iPhone. Below the Folder Tree is a row of access buttons. I have these a small as possible and they are icons for mail, calendar, people (contacts), tasks and notes. Click on an access button and the appropriate Outlook screen comes up. You can make Favourites of the access buttons, but I do not. As I have remarked before, I look for the fastest way to work. Notes are found by clicking on the Notes access button. A new Outlook Notes screen comes up. Notes are good for random things that may not be important enough to make a formal document. I have three important Notes that I do not allow to be archived. I do have archived Notes but not these three. The Notes synchronize to my iPhone. One Note is door codes. So at a night meeting, in the dark, outside, briefcase over my back, I can retrieve the lock box code for one volunteer meeting. You live through this once, and you quickly realize how important it is to have good Outlook information synchronized to your iPhone. 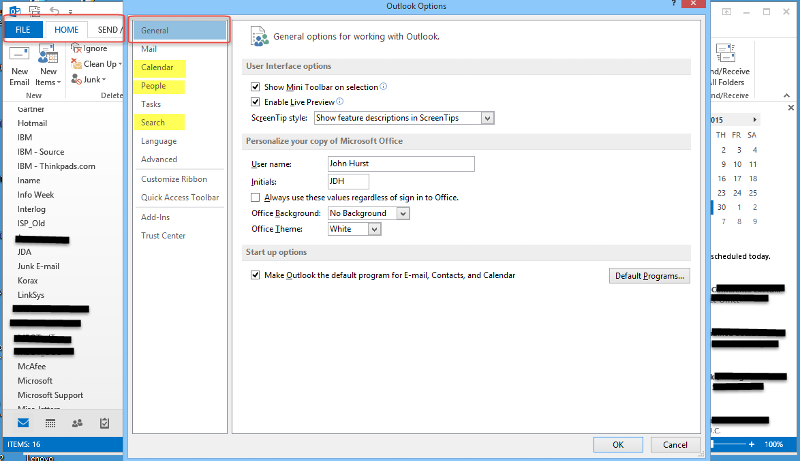 Email options are activated by clicking on Outlook, File, and Options. There are a LOT of options in here and I cannot discuss them all. In the General Tab, make sure Outlook is the default program for mail if you have more than one email tool (like Thunderbird). 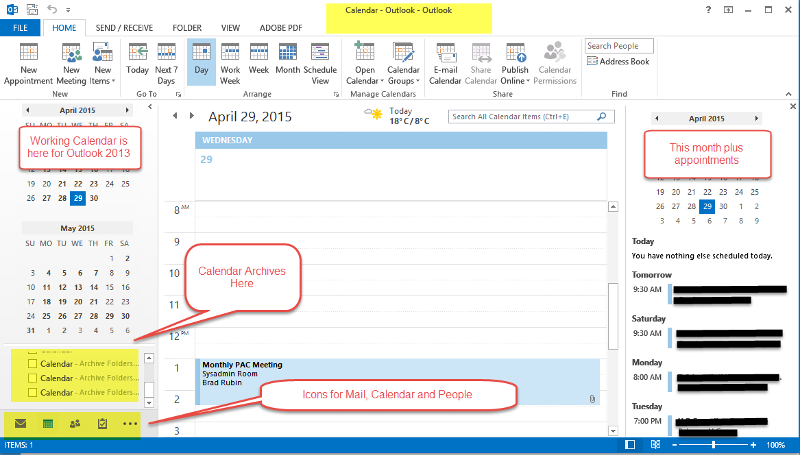 The Calendar tab allows you to set up default times, alert times, and work weeks. The People tab provides for name sort capabilities. I show names as First, Last but file as Last, First. This is a reflection of how I have always done things. The Advanced tab is where you set up Auto Archiving and where you can access Send / Receive settings. 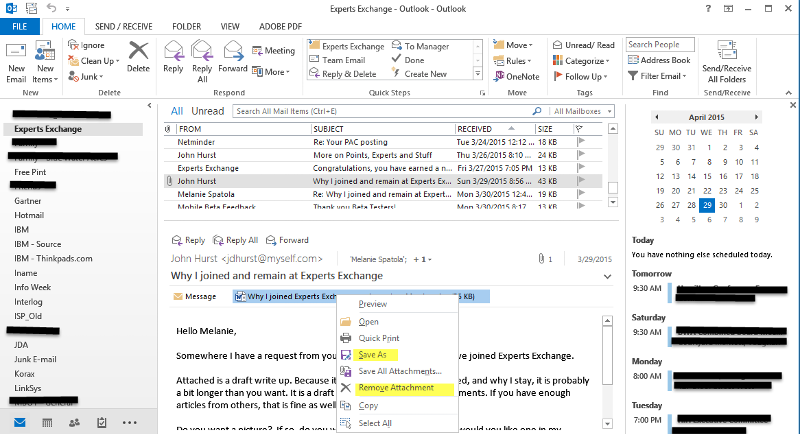 Look at my article Outlook for individual users for more detail and screen shots for these settings. Trust Center, Trust Center Setting button is where you set up Security and Download settings. If you are not a careful (dare I say suspicious) user, do not turn these settings off. There is lots to know about Outlook (books have been written on it) but I have covered the important things in Outlook that I use and that help make me work faster and more productively.